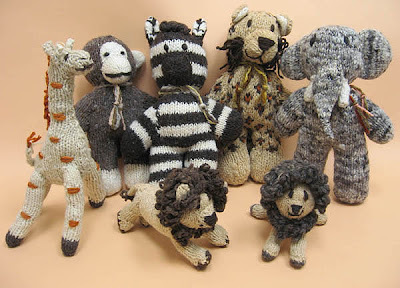 One of our top-selling gifts at Wedge Worldwide is the menagerie of Kenana Knitted Critters. Kids love these Fair Trade monkeys, elephants, lions, and zebras, all of which are made from wool and dyed with all-natural plant dyes. We’re not certain but we suspect that some big people might like these critters, too. Kenana Knitted Critters are produced on Kenana Farm, a cattle and sheep ranch in Njoro, Kenya, and the majority of Kenana Knitted Critters’ employees are women, the wives of men who work on Kenana Farm. Seventeen years ago when the owner and distributor of Kenana Knitted Critters, Gloria Delaney, first started her business, there were only 12 women who were knitting critters. Now Gloria has more than 1,000 employees. The employees of Kenana Knitted Critters also receive on-site lunches and literacy programs through their employer, while the health clinics available to the women address issues such as HIV/AIDS and family planning to name just a few. The clinics also educate employees, so that they’re well-informed and better able to care for themselves and their families. The clinic library contains books on many important health subjects that the women can reference. Rural life for a woman in Kenya is often quite demanding and difficult and most have few opportunities for employment and independence. A woman's time is often taken up with gathering firewood and water from many kilometers away, tending their essential vegetable gardens, looking after their own children and the children of sick relatives, or caring for elderly parents and in-laws. A traditional Kenyan family consists of a woman who stays home while her husband works. It is up to the man to provide enough income for medical care, food, books, and uniforms for children who go to school. In truth, a single income is rarely enough to adequately support a family. Being employed by Knitted Critters allows a woman to supplement her family’s income and gain self-sufficiency. The women are able to bring their children to work with them, and they also have the option of working at home as time allows. Knitters are offered savings accounts where they may choose to deposit some of their surplus income. This allows them to have their very own nest eggs that can be used for important purchases. The process of producing a Kenana stuffed animal starts out with the women gathering natural-colored brown fleece from the sheep on their farm. After washing, the fleece is dyed with natural plant dyes that the women grow themselves. The fleece is carded and spun by hand with spinning wheels fashioned from old bicycle wheels. After an adorable critter is finished, an information card is tied to the animal that bears the artist’s signature. Gloria says many children have emailed the women who knitted their beloved toy animals. We have to admit, the Kenana Knitted Critters are so endearing and charming, a few of us big people at Wedge Worldwide can't quite stop ourselves from squeezing and playing with them when a new order arrives in our warehouse. These charming jungle animals are a huge customer favorite for us and are sure to delight your young (or not so young) loved ones!